Ventricular contraction and relaxation is widely assumed to have an influence on the shape of the T-Wave. But up to now, it is not considered when solving the forward problem of electrocardiography. In this project we created a dynamic model that considers ventricular deformation and the associated movement of the electrical sources. Displacement information was extracted from cinematrographic and tagged MRI images using a 3D elastic registration procedure. Although tissue conductivities are known to impact on the results of the forward problem there is still no consensus concerning the organs that have to be included and the conductivities that should be assigned to these organs. Measurements of conductivities show considerable variations. 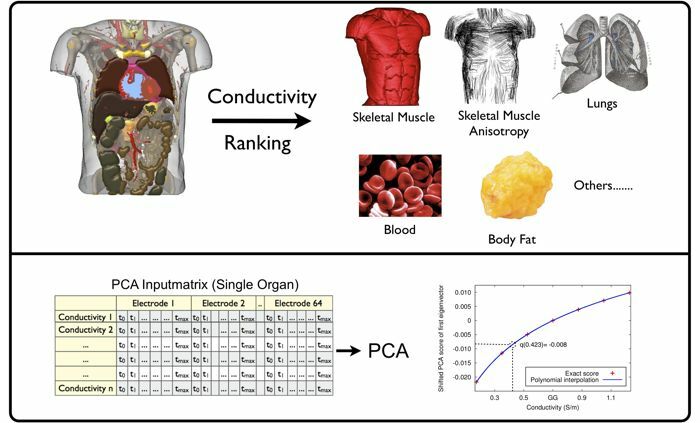 In this project we ranked the importance of the different organs and investigated the influence of the conductivity uncertainties on the ECG. In addition to that, we created a new method that allows to predict the influence of conductivity changes on the ECG. This PCA-based approach is significantly faster than the conventional forward calculation techniques (<1s vs. >1h).